Jef Mallett: Patty: We're not crazy. Really. The reaction to our decision last weekend to rappel down Lansing's 23-story Boji Tower in June (and to Wednesday's announcement of said decision) has been mixed, although current sentiment is leaning heavily in favor of "You guys are nuts." 1) We're not crazy. Really. 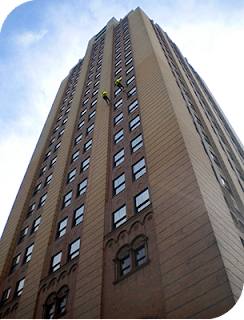 The thought of rappelling down a tall building scares the hell out of us, too. That's kind of the point, though. 2) Jef didn't rope us into this (pun intended). Actually, it was my idea. If you want to see what we're getting into, there's a three-minute video from last year's event on YouTube. And if you're interested in making a donation to the foundation on our behalf, please visit our pledge page. You're NOT? You got me fooled! Years ago when I drove a taxi in Tampa, I had 2 bumper stickers. One said: "Why be normal?" The other said: "Sanity is boring." But if you weren't crazy, then Frazz and Jane and Caulfield and ..., would be boring!